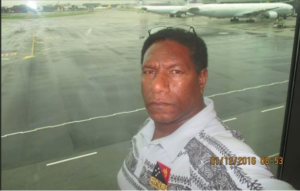 PANAMA CITY – Joe Moses, a Papua New Guinean, and the producers of a film “The Opposition” have released a letter calling Air France-KLM S.A. to account for their unexplained detention of Moses in Singapore’s Changi airport. He was en route to Panama to present the film, which depicts his Paga Hill community’s struggle against forced eviction, at Transparency International’s 17th International Anti-Corruption Conference (IACC) in Panama City. “He doesn’t need a visa to enter Panama, and he doesn’t need a visa to transit through Singapore or Amsterdam – that’s why we sent him this route,” said Hollie Fifer, the director of the film. Joe possesses a valid passport and three letters of invitation that he showed at the gate, where he was prevented from boarding. Representatives from KLM initially told Mr. Moses that he was unable to board because he needed additional letters of invitation. “[KLM] refused to have me on the phone, even though Joe asked three times,” Fifer said. “It was only on the fourth time that I asked what the reason was for Joe’s detainment.” When she pointed out that Moses was legally allowed to enter Panama without a visa, the staff then said it wasn’t possible “because anything can happen in transit.” It is unclear what they were referring to with this comment, and they refused to re-book Mr. Moses on any KLM flight. This reasoning was repeated several other times to Mr. Moses. The team re-booked Moses on a British Airways flight, on which he was transported, no questions asked, to Panama, where he entered legally and without issue. Moses was not given food or food vouchers, and was prevented from moving freely through the airport during his time there. He has no money on his person and was not escorted to the Western Union location to pick up a money order that was sent for him. KLM was not immediately available for comment. We will update this story should they respond. Ryan Patch cut his teeth telling campfire stories in the mountains of his native Colorado. He attended New York University’s Tisch School of the Arts and recently completed a Master’s in Screenwriting at Royal Holloway, University of London. He splits time between New York and DC, and sometimes things go horribly wrong and he lands in South Jersey. He works as a director, producer, writer, and story consultant on narrative, commercial, and documentary projects.